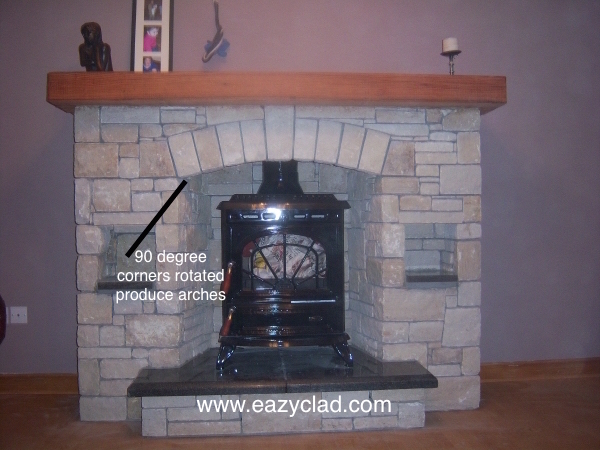 Making a stone arch may seem a daunting thought but with the right product such as stone cladding they can be created quick quickly and not at great cost, you may want to cover a window header with a semi circular finish or the arch over a fireplace. How do you do this with stone ? Answer is to use our special corner pieces which are produced in 1 piece on a 90 degree angle with a long end and short end so that you can alternate them when using on a external corner. If you then turn these upside down you can cover over a frame that can be formed in a arch shape using many building products such as wood, metal or concrete and attached the stone cladding to it to create the final shape you require.